One of the most serene places in Bonn is the old cemetery of Alter Friedhof. It is one of the most respected and revered sites in Europe. It is a notable burial place for famous people belonging to different walks of life and society. Quaint garden and pristine sculptures at the Alter Friedhof highlight the rich history of Bonn’s sepulchral culture. 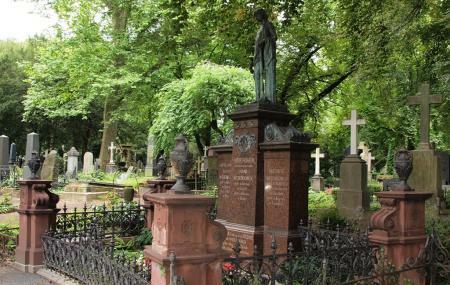 Located very close to the city central, the old cemetery was established in 1715 exclusively for knights, professors, researchers and non-Bonn natives. Burials were carried out even before its foundation. After 1884, the place was turned into a cultural site and the cemetery was officially decommissioned. It retains its 300 hundred years of museum appeal woven around a park. The graves can be located by a smartphone app offered by the Old Cemetery. The attraction is open for kids and pets. It is accessible by wheelchair. It is a sacred place. Maintain the sanctity of ambience. No smoking and drinking is allowed in the park. Littering and creating noise in the cemetery is a punishable offence. How popular is Alter Friedhof? People normally club together Poppelsdorf Palace and Altes Rathaus while planning their visit to Alter Friedhof. Old, very old, must be one of the best and most interesting cemeteries in Germany. Beethoven's mother and composer Schumann were buried as well as many other celebrities. A real place to be in nature and discover history. Good transport by the Bonn local system. Beautiful old graveyard with a lot of old tombstones. All entrances are closed except for the eastern entrance. There is a bus, tram and metro stop on 400 meters of the entrance. Be respectful because it is still being used by today. A must see if you are interested in the history of Bonn and the famous people who have lived here.